The peaks of Grand Teton National Park aren't the highest in the world, but they sit atop what might be nature's archetypes for mountains. You'll discover tucked-away gems like Mystic Falls Trail and Inspiration Point. Do some cultural sightseeing at Mormon Row Historic District and Chapel of the Transfiguration. Venture out of the city with trips to Mesa Falls (in Ashton) and Yellowstone National Park (Mud Volcano, Biscuit Basin, & more). Spend the 7th (Thu) surrounded by wildlife at Grand Teton. Next up on the itinerary: tour the water at your own pace with Colter Bay Village, cruise along Teton Park Road, take your sightseeing to a higher altitude at Oxbow Bend Turnout, Grand Teton National Park, and don't miss a visit to Chapel of the Sacred Heart. To see traveler tips, ratings, where to stay, and tourist information, refer to the Grand Teton National Park trip maker . Eau Claire to Grand Teton National Park is an approximately 13-hour flight. You can also drive. You'll gain 1 hour traveling from Eau Claire to Grand Teton National Park due to the time zone difference. Finish your sightseeing early on the 16th (Sat) to allow enough time to drive to Jackson Hole. Eschew the tourist crowds and head to Rendezvous Mountain and Grand Targhee Ski Resort. 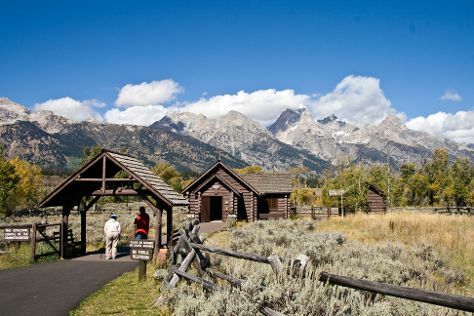 Get in touch with nature at Oxbow Bend and Teton Raptor Center. Venture out of the city with trips to Victor (Grand Teton Brewing Company & Headwaters Golf Club). And it doesn't end there: stroll through Antelope Flats, take in the exciting artwork at Mangelsen Images of Nature, play a few rounds at Teton Pines Country Club, and identify plant and animal life at National Elk Refuge. For more things to do, other places to visit, and tourist information, go to the Jackson Hole day trip app . Traveling by car from Grand Teton National Park to Jackson Hole takes an hour. Alternatively, you can take a bus; or take a bus. In June, plan for daily highs up to 72°F, and evening lows to 39°F. On the 21st (Thu), you'll travel back home.